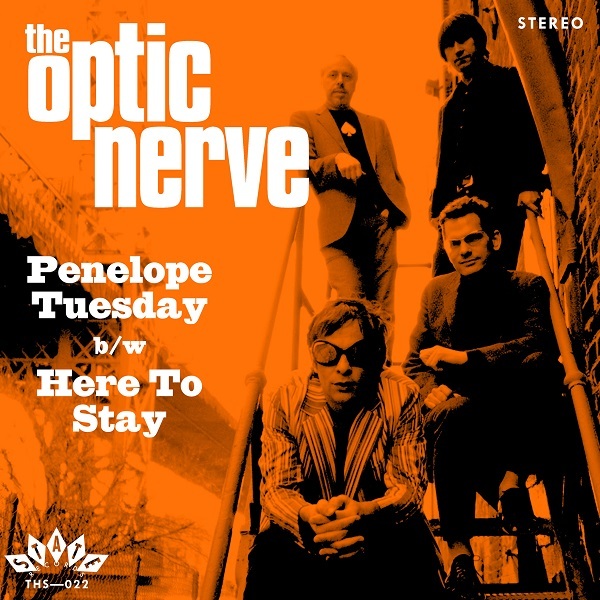 The Optic Nerve were a little known band spawned from the 80s New York garage scene who eschewed the synthesized music surrounding them. They were enamoured with the jangling guitar motifs of The Byrds and The Beatles. However, in the 80s their style of 60s folk rock was passé and the band soon disbanded, releasing only two singles during their brief existence. In 2005, band frontman Bobby Belfiore (songwriter and singer) and Tony Matura (lead guitar and vocals) reunited, adding Tom Ward (bass) and Mike Lind (drums) to record an album’s worth of new material that never saw the light of day. Ten years later State Records is now able to offer two of the best cuts from their proposed album. And finally, with the resurgence in 60s neo-psych, the time may be right for The Optic Nerve. The A Side contains “Penelope Tuesday,” a pure slice of British psych pop, a winning combination of catchy riffs and joyous vocals. You can easily visualize Penelope with long blonde hair dancing in summer sun-dappled light. The flip side is the folk rock ballad “Here to Stay,” showing an introspective and moodier side to their music with laid back vocal harmonies modeled after The Byrds. So be on the lookout for this single and grab a copy for yourself when it is released.